A trip to the shed yielded a large wooden triangle base and a long plank, which we carried to the hill. The combination of the hill and the triangle base created a double incline of sorts, complexity that, along with the possibilities for expansion, inspired thinking as well as the joy in movement that the installed slide invited. 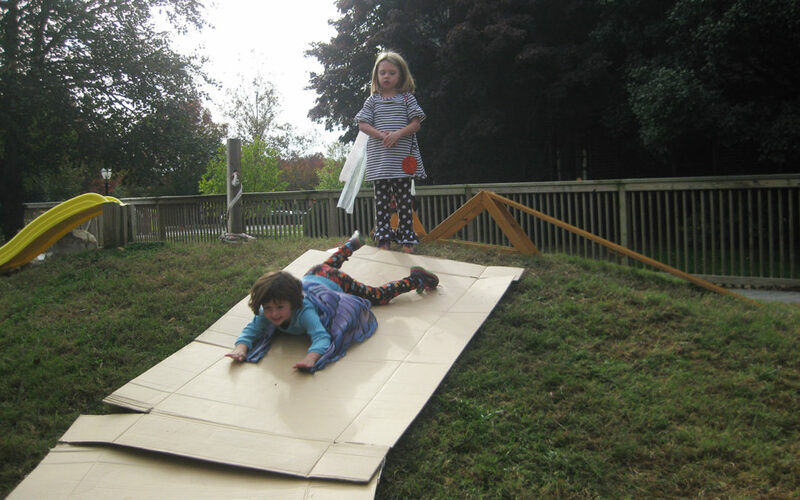 For a while the children enjoyed challenging themselves on the home-made slide by going down in novel ways (“Look at me go down on my side!”) and by adding extra planks to the bottom to extend the sliding experience. Intrigued by the possibilities of building structures on which they could travel, the children also made a “balance beam.” But it was not “stable,” they declared (there was some play on the bars on which the plank rested, so the plank slid a little. The children had encountered issues of stability…and therefore the vocabulary…at the block platform). Two children piled tree cookies under the plank high enough to touch the plank. They then declared the structure “stable,” not bothered by the fact that the plank still moved on the bars. To them, accomplishing the solution on which they’d decided (making the tree cookies support the plank) automatically made the balance beam stable. Expanding their play and making connections (literally), the children made a “playground,” (really an obstacle course), with the sequence: slide, two giant boxes to climb in, pop up houses to go through, tree cookies to walk on, a balance beam to cross, and a line of foam noodles to walk through. Though it was a brilliant concept, the execution fell apart quickly when some children just stayed at the slide, some went into the big boxes and stayed there, and C and G got distracted by the unstable balance beam. Had it been later in the year, I suspect the children’s approach to the “playground” would have been more organized and their original purpose sustained. Still, they returned to the idea every day for some time, and it continued to evolve. Every day we put all of the components away when we left the Outdoor Classroom. This was a conscious decision by the teachers. Sometimes leaving a structure up over time serves the evolution of an idea; sometimes the children are more inspired by having to reconstruct it anew each time. Of course, we can never know in advance which approach would be best. It’s always an educated guess…educated by knowledge of the children, the time of year, and experience with similar projects. In this way, the memory of the experience from the day before is the provocation (rather than an actual object or question). It happens that our guess that putting away the playground at the end of each day would inspire the children to go deeper into their idea was apt; the children extrapolated from the original idea, reconstructing the playground in one form or another every day. At one point they added two very big pieces of cardboard that they found in the shed. Placement of the cardboard was an issue one day, and the children discovered that they needed a continuous inclined plane to keep sliding; otherwise, they stopped. On another day, they discovered that they could overlap two pieces of cardboard to make an especially long slide that gave them a continuous ride to the bottom. and used what they had constructed as a prop for play that they narrated through “pretend that…” language. The children never put the playground back together in exactly the same way, and in time we noticed that pieces of the project had become a sort of alphabet with which the children created many stories throughout the year, long after the bees had abandoned the slide.